On Tuesday, a day before a storm rolled into Southern California, three humpback whales were encountered under ideal conditions off Newport Beach. It turned out to be a rare and magical experience for those on the Newport Coastal Adventure excursion, as one of the whales was a calf or young juvenile, less than a year old, learning to feed on schooling anchovies. Stunning aerial footage, captured by Chelsea Mayer, shows the anchovies tightly bunched into a massive bait ball, and the young whale following the lead of the adults as they lunge through the ball, ingesting thousands of anchovies per gulp. “Notice the smallest whale, still a baby, learning how to lunge feed from its mom; so cute!” reads the Facebook video description. One of the adult whales could be the mom, but it could also be that the young whale, recently weaned, is merely tagging along with two larger companions. Alisa Schulman-Janiger, a Southern California-based whale researcher, told For The Win that humpback whale calves are born between December and March, and usually separate from their moms in late summer. It’s likely that this trio is migrating from Central California to spend the winter off Mexico or Central America. Humpback whales will sometimes breach, or leap, placing their immense size and incredible power on broad display. And when Mother Nature provides a rainbow as a backdrop, such an awesome act appears all the more magical. The accompanying footage, showing a humpback whale spinning during its breach, was captured Wednesday in California’s Monterey Bay by Cheré Tamura from aboard the the Blackfin out of Monterey Bay Whale Watch. Definitely a matter of being in the right place at the right time. A breaching whale is reason to cheer, if you’re a marine mammal enthusiast hoping to witness a spectacular event. But to see three humpback whales breach, one after another, as if choreographed, is reason to cheer three times as loudly. It’s extraordinary, and earlier this month it was captured on video by Ocean Explorations Zodiac Whale Cruises in Nova Scotia, Canada. As viewers will note, the captain predicted the triple breach after seeing three humpback whales reveal their flukes to indicate they were diving. “These 3 whales were very peaceful beside us, after swimming/drifting over to us. Perhaps inspired by other whale(s) breaching not far away, that we could hear hitting the water, they 'decided' to go for it,” stated Capt. Tom Goodwin on Facebook. “Very classic takeoff and you can hear me say it three times, 'It's going to be a triple breach!' "
Three successive breaches, each spectacular in its own right, and of course the requisite cheers. The passengers might be spoiled for life, because it rarely gets better than this. A mostly white orca has been photographed by Russian researchers near the Commander Islands in the Bering Sea. The rare sighting was of a leucistic female orca that had not been documented in several years. “Not the famous Iceberg this time, but the female CO210 also known as ‘Mama Tanya’ (named after the main photo-ID researcher of our project Tatiana Ivkovich, who is also blonde). Iceberg, an adult male, was first documented in 2012 off the Kamchatka Peninsula in eastern Russia. The Commander Islands are located about 100 miles east of the Kamchatka Peninsula. A humpback whale performed its version of a cannonball Friday off Port Macquarie in New South Wales, Australia, breaching into the air and drenching astonished whale watchers. The accompanying footage, captured by Tash Morgan for Port Jet Cruise Adventures, shows the whale’s up-close breach and spin, and water cascading over laughing spectators and the top of the vessel Wave Rider. The whale quickly surfaces, as if to gauge its success, and passengers are left and in awe and with the memory of a lifetime. Scuba divers could barely contain their excitement during a rare face-to-face encounter with a gray whale Sunday off Monterey, Ca. Ben Laboy and Nicole Guido-Estrada were part of an expedition with Bamboo Reef Scuba Diving Centers when the curious mammal approached, as the divers screamed with glee through their breathing gear. Reached via email, Laboy said the encounter occurred at a depth of about 40 feet, not far from fabled Cannery Row in downtown Monterey. “I had seen something behind Nicole, and was squinting at it for a solid 5-10 seconds trying to figure out if it was moving or not," Laboy said. "And then when it materialized, we both realized it was an animal, and that's about where the video starts." Alisa Schulman-Janiger, a California-based whale researcher, said the gray whale’s behavior appeared to stem from curiosity. The divers did not seem to be in danger. A Bamboo Reef spokesman said two others in a group of 10 also saw the whale. The gray whale population is estimated to number about 29,000. The mammals, which can measure to about 50 feet and weigh up to 40 tons, are migrating from summer feeding grounds in Arctic waters to winter nursing lagoons in Baja California, Mexico. The southbound migration is currently peaking off Central and Southern California. On Sunday, Monterey Bay Whale Watch reported multiple sightings Sunday and posted video clips showing the barnacled cetaceans migrating along the coast (clip posted above). When Capt. Todd Mansur spotted a floating whale carcass through his binoculars on Saturday, he had a feeling there might be hungry sharks nearby. Sure enough, the dead minke whale, believed to have been killed by orcas, had become a buffet for perhaps two dozen blue sharks. The sleek predators star in a highlight video published Sunday by Dana Wharf Whale Watching. The surreal footage was captured beyond the remote windward side of Santa Catalina Island during an 8-hour excursion that also featured live whale and dolphin sightings. As viewers can see, the sharks were not frenzied; they roamed the whale’s perimeter slowly and took turns tearing flesh from the base of its fluke. Alisa Schulman-Janiger, a researcher who was aboard the Ocean Adventures during this encounter, noted that the whale’s tongue and throat were missing. Transient orcas, or killer whales, are known to prey on minke whales, and removing the protein-rich tongue is one of their trademarks. The researcher said it was likely that orcas killed the 30-foot whale at some point before the sharks arrived. Encounters such as this are rare for Southern California whale watchers because these events typically occur far offshore. Most whale-watching voyages last 2-3 hours and boats do not stray far from the mainland. 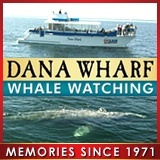 Dana Wharf offers sporadic 8-hour voyages – the next is scheduled Jan. 28. A whale carcass discovered late Wednesday inside Long Beach Harbor has been identified as fin whale. The juvenile mammal measured 40 feet and probably was struck by a ship and brought into the harbor – unbeknownst to the crew – attached to the vessel. A necropsy, conducted by NOAA, will be performed Friday or Saturday. The carcass remained tied to a West Basin pier to keep it in place. There were no visible wounds to indicate a ship strike, but much of the carcass remained submerged and was not inspected. Schulman-Janiger, a whale researcher with the Natural History Museum of Los Angeles County, said the whale, which was “freshly dead." The mammal was likely less than 1 year old, but had already been weaned. “So it was not taken from its mom,” the researcher said. Fin whales are the second-largest whale species, behind blue whales. The sleek mammals can reach lengths of about 80 feet. Several fin whales have been spotted recently off Long Beach. On one day during the past week, as many as eight fin whales were spotted by passengers aboard whale-watching vessels. Fin whales, which are sometimes called “greyhounds of the sea” because of their speed, prey largely on shrimp-like krill and small fish.